I love to crochet and in my day have been known to make granny square blankets as well as toys. Until I came across this lovely book, I had absolutely no idea there were so many different kinds of squares you can make. It's amazing what you can do to embellish a sweater with a little crochet flower. And you can always use up all those scraps of yarn lying around to make a multi-colored throw. Plus, with all the new kinds of yarns, you'll be spoiled for choice. I found the following patterns rather pretty: Eight-Petal Flower, Lacy Baby Afghan Block, Cotton Butterfly & Trim, and I loved the slippers on page 111. 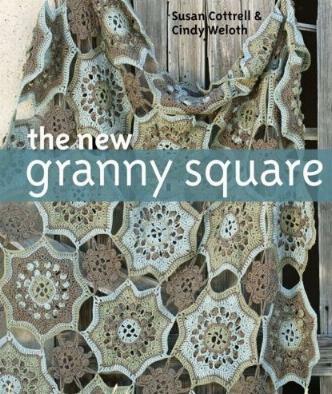 You'll not only find squares to crochet, but also motifs, embellishments (I love that skirt on page 79), and granny square creations. Learning to crochet is not difficult to learn and it's really relaxing, and somewhat addictive. There are instructions for the basic stitches so if you are a beginner or just need a little brushing up, this book will help you. Conclusion - Such an interesting book full of ideas.